Stash Tea has announced that its products will now be available in Keurig-compatible single-serve tea cups in offices for tea lovers looking for a fast and satisfying cup of tea. 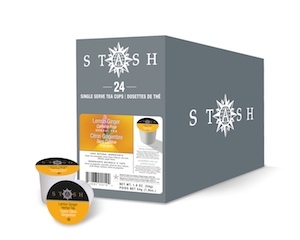 The initial launch of Stash Tea in 24-count format includes five varieties of tea: Super Irish Breakfast, Pomegranate Raspberry Green Tea, Lemon Ginger, Chai Spice Black Tea, and Moroccan Mint Green Tea. The format is available for offices across Canada and the U.S.